Necklaces come in various styles, lengths and sizes. All of our designs are unique and bring a sense of style to any outfit. A necklace can enhances the neckline of any outfit. The necklaces below are some of the necklaces that we have designed for our starting collection, more designs are coming soon. 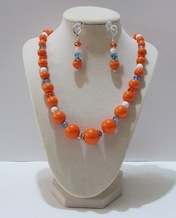 earrings, necklace, and bracelet make up spring passion.